The search engine optimization options allow you to change your HTML title tags as well as set up search data analyzation tools. The SEO options can be found under Dashboard > Appearance > Theme Options > SEO. The section consists of 4 option sub-sections: SEO Options, Google Webmaster, Bing Webmaster, and Yahoo Site Explorer. IMPORTANT: Before you begin to change these settings, make sure that your site is indexable by search engines. Here, you can change the default HTML title tags of your site. Here, you can adjust the frontpage's HTML title tag and meta description tag by using each respective text field. 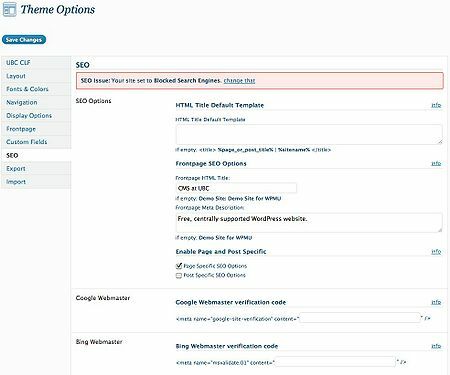 This section allows you to enable SEO options specific to pages and posts by checking off the respective checkboxes. The options will appear as fields on the respective Edit Page and Edit Post pages. This section offers a text box where you can enter your Google Webmaster verification code to check how your site is doing on Google. Simply leave your code in the text box (and save your changes) to stay verified with Google Webmaster. NOTE: If you enter text in the box, a meta tag will be enabled. This section offers a text box where you can enter your Bing Webmaster verification code to check how your site is doing on Bing. Simply leave your code in the text box (and save your changes) to stay verified with Bing Webmaster. This section offers a text box where you can enter your Yahoo! Site Explorer verification code to check how your site is doing on Yahoo! Simply leave your code in the text box (and save your changes) to stay verified with Yahoo! Site Explorer.